This reminds me how little I've worn my floppy hat! I so wish I could rock a floppy hat I think you need long hair to pull it off. I love those hats and I really need to get one. I think they're adorable BUT I tried one on and couldn't pull it off. I just don't have the personality for it. Damn! She is so basic but in same time very chic . I appreciated very much . totally giving me the urge to wear a floppy hat or any type of hat for that matter. Cute post! 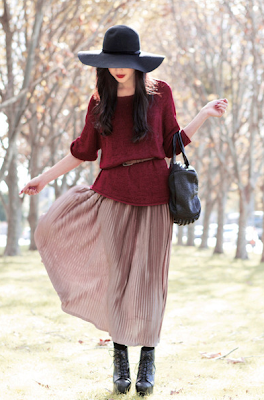 Floppy hats are so gorgeous but i still dont think i have the confidece to wear them! You'd look gorgeous in one though! I love floppy hats! That 70s inspired set is to die for if only I could pull of such beauties. Oh, gotta love that hat. Very cool things to go with it too. I must think about this floppy hat more. Great post!